I installed the ti.paint module (link) from the marketplace and installed the included demo app. It works on Android, but I get a "couldn't find module: ti.paint" error on iOS. Please help. Also: In a separate test, i installed the module by dragging the .zip file to the /Library/Application Support/Titanium folder and was met with the same error. Finally, it appears as if the build process correctly processes the modules (in that it unzips it and creates appropriate folders), just doesn't recognize them when I include them in my app.js file. This is quite urgent, please help. 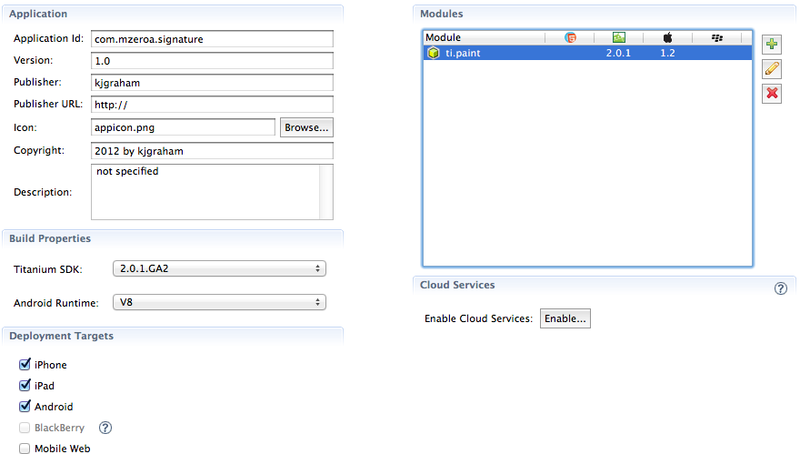 You also need to include the module in the code, and not only in the tiapp.xml file. From now on, you can call Paint. [functionName] to call the module. Make clean your build folder and delete application instance from directory or simulator. Make sure you are logged in to Titanium Studio with your Titanium Appcelerator A/C credentials. Not the answer you're looking for? Browse other questions tagged titanium appcelerator titanium-mobile appcelerator-mobile titanium-modules or ask your own question.